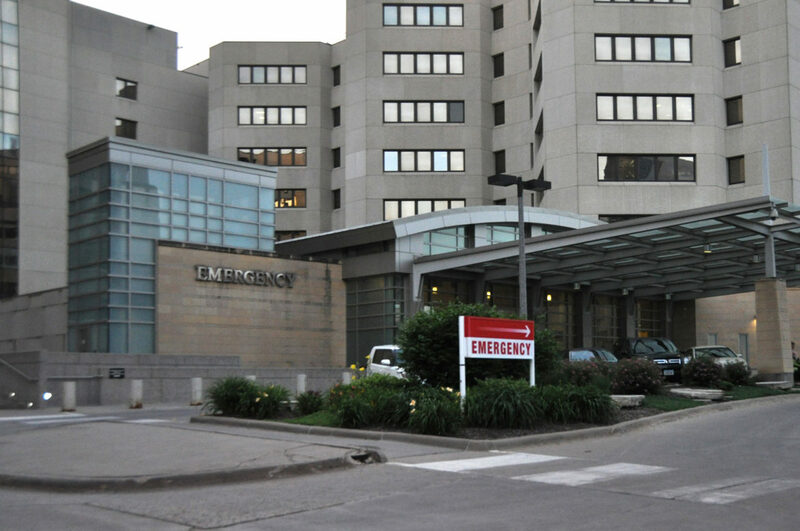 The emergency room entrance at University of Iowa Hospitals and Clinics. Photo taken June 12, 2018. Slaps, kicks, bites and curses are daily hazards faced by staff in hundreds of emergency rooms. And the threat of workplace violence seems to be getting worse. A new survey has found that nearly 50 percent of emergency physicians have been physically assaulted on the job, and nearly 70 percent believe violence in their workplace is increasing. Nearly half of the respondents said hospital visitors have also been physically harmed in attacks, with 80 percent reporting that these incidents disrupt patient care, according to the survey prepared for the American College of Emergency Physicians. The rate of workplace violence in the health care industry is 3.8 times higher than all private industry, according to the federal Bureau of Labor Statistics. The new survey reflects a growing concern among health professionals that violent incidents are on the rise. “I would say that there’s a growing desire to address the problem,” Scott McIntyre, vice president for communications at the Iowa Hospital Association, said Thursday. “We’ve been asked to provide different kinds of training and education, and have responded that way to help hospitals deal with that,” he said about the association’s Iowa members. Previous studies have noted an uptick in violence against staff in emergency rooms. National Nurses United, the largest union of registered nurses, found that rates of workplace violence grew by 110 percent in privately owned hospitals between 2005 and 2014. Some experts blame the growing violence on tighter restrictions on opioid prescribing and overcrowding in emergency rooms. But 34 percent of doctors in the survey said the biggest contributing factor was the lack of consequences for the attacker. According to the survey, only three percent of respondents said their hospital pressed charges against an attacker. Forty-two states have stiff penalties for assaulting nurses, and in at least 29 states it’s a felony to assault emergency room staff. Iowa is not one of them. But hospitals don’t want to develop a reputation for having patients arrested, according to Terry Kowalenko, a Michigan emergency physician who has studied violence in emergency departments. There’s also a widely held belief that law enforcement won’t support emergency workers who want to press charges, he added. The federal Occupational Safety and Health Administration has tried to combat violence in emergency rooms by increasing the number of its inspectors dedicated to workplace violence cases from 11 in 2010 to 86 in 2014. But according to a report by the Government Accountability Office, OSHA says it doesn’t have plans to develop a violence prevention standard for healthcare workers in light of other priorities. Survey respondents said hospitals could address some safety concerns by adding more guards, cameras, metal detectors and implementing enhanced screening of visitors. But correcting the problem may require a cultural shift in emergency rooms where there’s an expectation that violence is just part of the job. “We’ve grown to this level of tolerance,” said Leigh Vinocur, former chair of ACEP’s emergency department violence committee, noting that she was once nearly strangled by a patient. This kind of extreme violence is less tolerated in emergency rooms, but she said most workers put up with the small acts of abuse, like curses, threats and unwelcome sexual advances. This story was produced by FairWarning, a nonprofit news organization based in Southern California that focuses on public health, consumer and environmental issues. IowaWatch contributed comments from Iowa. The Justice Department announced a 22-count indictment Thursday against a Nebraska railroad services company and its owners related to an April 2015 explosion that killed two workers and seriously injured a third.